Implant constraint failures are the consequence of inadequate balance between the given, intrinsic stability of the implant replacing a joint and the extrinsic stabilization provided by the soft tissues enveloping the joint. Achieving this balance is one of the central challenges in total knee arthroplasty (TKA). The success crucially depends on preoperative assessment of the deformity and the soft-tissue situation (extrinsic stability), the correct choice of implant (intrinsic stability), which also depends on the former, and the adequate intraoperative treatment of the soft-tissue stabilizers. Therefore, this chapter will focus on the aspects of intrinsic implant stability against the background of the functional interaction with the (often pathologically deformed) soft-tissue apparatus of the knee. 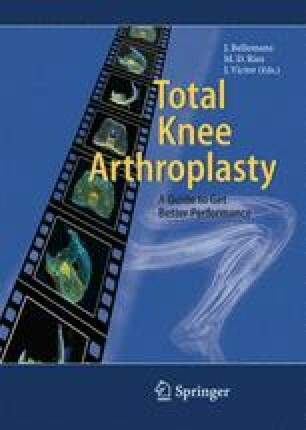 Our guiding principle will be: “As little implant constraint as possible with the achievable soft-tissue stability.” For this reason we start from a systematic classification of knee joint deformities, from which one can derive an algorithm that will facilitate the decision for a certain implant constraint combined with suitable soft-tissue treatment.